An often overlooked pitcher on successful Chicago Cubs teams of his era, Guy Bush was among the National League’s winningest pitchers from 1928 to 1934 and finished with 176 victories in his 17-year career. Success was far from foretold when the 21-year-old Mississippi Mudcat made an unlikely debut for the North Siders in September 1923. After his Class D league folded, Bush was afraid to leave the friendly confines of the rural South for those of Wrigley Field (at the time known as Cubs Park); consequently, he assumed an alias and hid out in another low-level league for six weeks before being persuaded to come to the Windy City. Guy Terrell Bush was born on August 23, 1901, in Aberdeen, a small town and once a busy port on the Tombigbee River in northeastern Mississippi.1 His parents, George W. and Willie (Gray) Bush, married in 1899 and raised six children (Gahal, Guy, Getrude, Granville, Gay, and Gazell) on their cotton farm in Monroe County and later Lee County, about 150 miles southeast of Memphis. Growing up in hard economic times, Guy had little time to pursue sports and worked year-round on his family’s farm. Sensing an opportunity for Guy to pursue a career as a soldier, George and Willie sent him to the nearby Tupelo Military Institute to start high school in 1916. Working on campus to pay for his tuition, room, and board, Guy became interested in baseball. Tall and lanky, he impressed his coaches with his ability to throw and pitched for four years in high school (and in some accounts for an additional year as a postgraduate). Bush often told the story that when he left the school, headmaster George W. Chapman gave him $250 and told him, “Pay it back out of your baseball earnings.”2 Playing semipro and independent ball in leagues throughout the northern part of the state, Bush had a stroke of luck while pitching for a team that played in Shelby and Merigold, two small towns in Bolivar County, Mississippi, in 1923, when George Wheatley, president and scout of the Greenville (Mississippi) Swamp Angels, saw him pitch and signed him to a professional contract. On Catalina Island, California, in 1924, Bush, participating in his first Cubs spring training, impressed manager Bill Killefer with a “mighty neat curve ball and plenty of speed.”6 He made the Cubs’ Opening Day roster, but the 6-foot right-hander was optioned to the Wichita Falls (Texas) Spudders of the Class A Texas League in May after just two appearances. With a 9-3 record in 99 innings as a starter and reliever, Joe, as sportswriters began calling him for “no particular reason,”7 was recalled two months later to replace the ailing Grover Cleveland Alexander. Years later, Bush said that Alexander, more than any other player, had helped him make the transformation from a “thrower” into a big-league pitcher.8 After a strong eight-inning outing in his first major-league start, surrendering three runs (two earned) and getting the loss, 3-2, against the Phillies on July 16, Bush pitched a complete game and struck out seven to defeat the Boston Braves 7-4 on July 20 and earn his first victory. With his 16 appearances evenly divided between starts and relief appearances, he won two of seven decisions and notched a 4.02 ERA in 80? innings. For the last-place Cubs in 1925, the inexperienced Bush tied for the NL lead in saves (4) and tied for second in the league in appearances (42) while proving that he was equally valuable as a starter, reliever, and all-around fireman, logging 182 innings, but winning just six times in 19 decisions. With the hiring of a new manager, Joe McCarthy, the Cubs and Bush were in transition in 1926. While Marse Joe ushered the team into an era of hitting, Bush was developing into a trustworthy and effective starter. After flopping just before midseason during a stint as a starter (with an ERA approaching 6.00), he was given another opportunity to prove himself in August with the Cubs just 6½ games out of first place, Bush arguably had the best month of his career. He won all five of his starts and another game in relief, and pitched consecutive shutouts over the Giants and the Brooklyn Robins in Chicago as part of a stretch of 25 consecutive scoreless innings. For the month Bush surrendered just one earned run in 51? innings for a microscopic 0.17 ERA. Extending his winning streak to eight games in September, Bush finished with 13 wins (the first of ten consecutive years of at least ten wins), and had a 2.86 ERA in 157? innings, while the Cubs became stagnant down the stretch to finish in fourth place. Named a starter to begin the 1927 campaign, Bush hurled an 18-inning complete game on May 14 to defeat the Braves 7-2 in Boston. Always a quick worker on the mound, he faced 71 batters in that game, which lasted just 3 hours and 42 minutes. In his next start (one week later), Bush pitched another complete game to defeat the Robins and it appeared as though he had become one of the game’s elite pitchers. But he was stricken by a case of mumps and missed four weeks in June. In his first start in six weeks, he shut out Brooklyn on five hits, winning 1-0 on July 10 to give the Cubs a surprising one-game lead in the pennant race. Often a victim of poor run support, Bush won just three more times (losing seven) while the Cubs faltered from late August into September by losing 11 of 13 games to fall out of contention and end again with a fourth-place finish. During the first game of a doubleheader on September 17 Bush pitched a 13-inning complete game to defeat the Braves 3-2 in Chicago for his tenth and final victory of the season. He logged 193? innings and posted a team-best 3.03 ERA. After a successful 1928 campaign, in which he won 15 times and logged 200-plus innings for the first of seven times in his career, Bush braced for even more personal and team success in 1929. After the Cubs’ offseason acquisition of Rogers Hornsby, many experts picked them to take the pennant. Bush tossed a three-hit shutout to defeat the reigning NL champion Cardinals 4-0 on April 21 in his season debut. Starting regularly (30 starts) and used in relief consistently (20 times), Bush was the hottest pitcher in baseball for most of the season. He pitched a ten-inning complete game to defeat the Robins, 6-5, in the first game of a doubleheader on July 20 and put the Cubs in a first-place tie with the Pittsburgh Pirates. Bush tossed a three-hit, 1-0 shutout over the Braves on August 1 and a complete-game victory against the Phillies on August 9 to improve his record to 16-1. His personal-best 11-game winning streak was broken by the Braves on an unearned run in a relief outing on the 12th, but three days later Bush hurled his tenth complete game in 11 starts to defeat the Robins. At that point he was running on fumes. McCarthy had a tendency to overuse hot pitchers even as the Cubs ran away with the pennant. With 11 appearances in the month of August (six starts), Bush’s complete-game win over the Reds on August 25 was his 18th and final victory of the season. After a disastrous September (0-3 and a 6.03 ERA), Bush’s position in the starting rotation was in jeopardy for the World Series, the Cubs’ first since 1918. By season’s end Bush had appeared in a major-league-high 50 games (including 30 starts), pitched a career-high 270? innings, won 18 games, and tied for the NL lead in saves (8). After the Cubs lost World Series Games One and Two in Chicago with Root followed by Malone on the mound, McCarthy “decided to gamble” (in the words of the Chicago Daily Tribune) by choosing Bush to start Game Three against Connie Mack’s vaunted Philadelphia Athletics, the overwhelming Series favorites.10 Bush, who had pitched two innings of relief in Game One, was surprised to be named the starter, but not by the outcome of the game: He held the A’s to nine singles while going the distance in a 3-1 victory in Philadelphia’s Shibe Park. F.C. 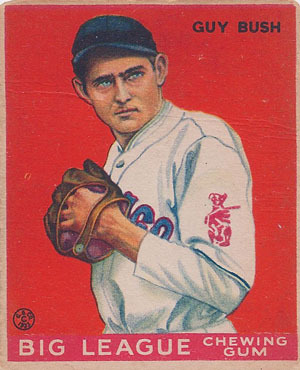 Lane wrote in Baseball Magazine that Bush was underappreciated during his career “and generally not rated as a great pitcher.” Bush approached the art of pitching cerebrally and “dissect[ed] every game with painstaking care,” Lane wrote.11 After Bush’s victory, the A’s crushed Root and three Chicago relievers during the seventh inning for 10 runs in Game Four to come back from an eight-run deficit and then edged out Malone with a walk-off win in Game Five to win their first Series since 1913. Bush had a disastrous start in 1930. Pounded in his first five appearances (two starts) and saddled with an 11.02 ERA in 16? innings, Bush slipped while fielding a ball, twisted his elbow, and missed three weeks in May. After several relief appearances, he rejoined the starting rotation but his fastball lacked velocity. Pummeled by opponents (they batted .316 against him), Bush surrendered a staggering 174 runs and a new (post-1900) National League-record 155 earned runs in just 225 innings, and led the major leagues in wild pitches (12). Amazingly, he won 15 games (thanks to the Cubs’ offense) and lost just ten times. In the “Year of the Hitter,” Bush’s 6.20 ERA was not the worst in the league; that honor went to the Phillies’ Les Sweetland, who posted a 7.71 ERA in 167 innings. Betrayed by their pitching and inconsistent offense in September, the Cubs were overtaken by the St. Louis Cardinals in the last two weeks of the season and finished in second place. Tall, dark, and handsome, with slicked-back hair and sideburns, Bush had a reputation of a quirky player who “pride[d] himself as a slugger,” even though he batted just .161 (143-for-888) during his major-league career with no home runs and 52 runs batted in.20 Sportswriters often joked that when the National League introduced new baseballs with thicker stitches to improve pitchers’ grip and a thicker hide to slightly deaden the ball in 1931 in reaction to the record-setting hitting barrage the previous season, Bush bemoaned that his hitting would suffer. He was also an accomplished fielder, despite his delivery, and tied for the NL lead in fielding percentage (1.000) for three consecutive seasons (1935-1937). Cubs batters continued to bash the ball in 1931, but the pitching staff was mired in another collective funk, ranking sixth in earned-run average and runs surrendered. Bothered by an early-season arm injury through most of July, Bush pitched inconsistently and rumors circulated that he was washed up. However, he unexpectedly turned his season around beginning on July 31 when he pitched a complete game to defeat the league-leading Cardinals 10-3 in St. Louis. Recording eight complete games in his last 12 starts, Bush was the “mainstay of the team” and finished with a 16-8 record.21 Within a span of five weeks, Bush threw his only two career one-hitters and both were unusual. At the conclusion of his dominating 1-0 victory over the Cardinals on August 9, teammates rushed to congratulate Bush for his first no-hitter. Minutes later, the mood turned somber when word emerged from the press box that George Watkins’ first-inning grounder, which shortstop Woody English had fielded poorly then dropped, was scored a hit and not an error. The episode sparked national debate. Outraged by the general lack of information given to players and fans during games, such as the number of hits and errors, The Sporting News led efforts to require that scoreboards show hits and errors.22 On September 13 at Wrigley Field in the second game of a doubleheader, Bush surrendered just a legitimate single, but two errors led to an unearned run in an 8-1 drubbing of the Braves. Bush had the reputation of being one of the most athletic and physically fit players on the Cubs. Reporting on his legendary workouts at spring training in Catalina Island, the Associated Press wrote that “no one can outwork him.”23 Asked about his offseason preparation, Bush responded, “I smoke several cigars a day, eat sparingly, and just study baseball,”24 (which might also explain his rail-thin physique). In 1932 the Cubs became the last major-league team to put numbers on players’ uniforms. With four complete-game victories in his first six starts, Bush, donning number 14 (and later switching to 24), was off to a fast start for second-year manager Rogers Hornsby. The 30-year-old Bush pitched a 13-inning masterpiece, defeating the Braves, 5-3, in Boston on June 12 to give the first-place Cubs a 1½-game lead, but the team was on the verge of unraveling. In the midst of player injuries and inconsistencies, shortstop Billy Jurges was shot twice by a local chorus girl in early July. The team sputtered to a 26-29 record in June and July. Hornsby was fired on August 2. The manager was a chronic gambler and had racked up an estimated $40,000 of debt. He borrowed money from players, including Bush, to pay his bookies. In early August the Chicago Daily Tribune reported that Commissioner Kenesaw Landis had launched an investigation into gambling on the Cubs. “I don’t give a damn what anybody says, the gambling stories printed in Chicago are lousy,” said Bush, who was one of the targets of the investigation.25 Eventually five players, including Bush, were exonerated during a hearing conducted in St. Louis in August. The Cubs rallied around first baseman Charlie Grimm, who succeeded Hornsby. A player-manager, Jolly Cholly was easygoing and helped relax the team, whose players had been on edge all season from Hornsby’s autocratic ways. As Bush won eight of ten decisions in the last six weeks of the season, the Cubs went 37-18 for Grimm to overtake the Pirates and cruise to the pennant. For the first time since 1926, the Cubs pitching staff paced the NL in team ERA (3.44), led by 23-year-old Lon Warneke’s 2.37. Bush’s 19 wins ranked third in the league (behind Warneke’s 22 and Brooklyn’s Watty Clark’s 20). He posted a 3.21 ERA in 238? innings. Facing the overwhelming favorite New York Yankees in the opening game of the World Series at Yankee Stadium, Bush surrendered just three hits in 5? innings but was unexpectedly wild, issuing five walks and giving up eight runs in a 12-6 shellacking. The Sporting News reported that Bush was still smarting from a finger injury suffered in his last start of season, and that the “top of his right finger looked like the sawed-off end of a raw ham.”26 With the Cubs down three games to none, Bush had a chance to redeem himself in Game Four, but lasted only one-third of an inning, facing five Yankee hitters and surrendering two singles and a walk and hitting a batter. The Yankees, cruising to another lopsided win and their first World Series championship since 1928, helped manager Joe McCarthy exact revenge on the team that had fired him just before the 1930 season ended. The Series is better known today for Babe Ruth’s “called shot” in Game Three off Charlie Root. Bush was among the highest paid pitchers in the National League from 1930 through 1933. He injured his arm during spring training in 1933, but remained confident in the Cubs’ ability. Bush was confident that the Cubs would win the pennant again.27 But for the first ten weeks of the season, he struggled (failing to make it beyond the fifth inning in five of ten starts), and the Cubs treaded water in fourth place, barely above. 500. Tensions and frustrations were high even at the beginning of the season when, during an especially poor start against St. Louis, Bush challenged Dizzy Dean to a fight during the game. While Dean heckled Bush, Grimm clashed with Cardinals manager Gabby Street. Bush was a streaky pitcher and at 31 had just perfected a new pitch to replace his slowing fastball. “I got my new screwball down,” Bush said. “Last year I couldn’t throw it as often as I wanted because it made my finger sore.”28 A complete-game victory over the Pirates at Wrigley Field on June 16 commenced one of his best and longest streaks. Used almost exclusively as a starter for the first time in his career, Bush responded by winning 15 of his final 21 starts, including 16 complete games. For just the second time in his career, he tossed shutouts in consecutive starts when he blanked the Phillies on three hits in a 5-0 victory in Philadelphia on August 24, and then on short rest tossed a 2-0 two-hitter against the Dodgers in Brooklyn. Aiming for his 20th victory in his last start of the season, against his rival Dizzy Dean in St. Louis, Bush hurled a five-hitter and struck out a season-high seven batters in a 12-2 thumping of the Redbirds. “I get more satisfaction out of beating that guy once than I do winning from anyone else twice,” Bush said of facing Dean.29 Bush set career highs in wins (20), starts (32), complete games (20), and shutouts (4), while posting a career-low 2.75 ERA in 259 innings. Despite his preseason predictions, the Cubs finished a disappointing third. Despite his claim that he was excited to be going to Pittsburgh, Bush regretted leaving Chicago (he continued to live there during the offseason) and had difficulty adapting to his new team and surroundings in 1935. Plagued by inconsistencies, he twice lost his position in the starting rotation, but still managed 25 starts in 41 appearances. Proclaimed a “bust” by The Sporting News,31 Bush finished with a disappointing 11-11 record and a 4.32 ERA in 204? innings. Like his teammate Charlie Root, Bush’s legacy is inextricably tied to Babe Ruth. In a fateful game on May 25, 1935, against the Boston Braves, Bush relieved Red Lucas and surrendered the final two home runs of Ruth’s career. (Ruth had already hit a home run off Lucas.) The second of the two surrendered by Bush, Ruth’s 714th, was the first home run ever to clear the right-field grandstand at Pittsburgh’s Forbes Field. “I got a signal for another fastball and I came through with one,” Bush recalled in 1974 when Hank Aaron broke Ruth’s home-run record. “[Ruth] got ahead of the ball and hit it over the triple deck, clear out of the ballpark. I’m telling you, it was the longest cockeyed ball I ever saw in my life.”32 The 1992 film The Babe underscored the rivalry between Bush and Ruth which began in the 1932 World Series when Bush led the Cubs’ merciless harassment of Ruth. Bush’s fall from an 18-game winner in 1934 to ineffective mop-up artist in 1936 was a startling and unexpected surprise.33 Bush, who at the time ranked second in the National League in career wins behind Jesse “Pop” Haines of the Cardinals, was released in July and signed with the Boston Bees (so named since 1936 after their horrendous 38-115 record the previous season). Manager Bill McKechnie, well known for his handling of cast-off pitchers, coaxed a 4-5 record and 11 starts out of Bush in the second half of the 1936 season. On arguably the major leagues’ best pitching staff in 1937 (the Bees led baseball with a 3.22 ERA), Bush rebounded with an above-league-average 3.54 ERA in 180? innings. He had 11 complete games in his first 16 starts. But Bush was often the victim of poor run support, struggled the last two months of the season, and finished with an 8-15 record while starting 20 times in 32 appearances. Like many players of his era, Bush wrung every possible inning from his arm before retiring. He was sold to the Cardinals before the 1938 season, but was released by St. Louis in early May. He signed with the Los Angeles Angels, the Cubs’ affiliate in the Double-A Pacific Coast League, for an estimated $5,000 bonus, and helped lead them to the league title in 1938 as a spot starter and reliever. Retiring in Chicago with his wife, Bush opened a tavern, suffered the loss of his gas stations due to fuel rationing during World War II, and worked for the Pullman sleeping-car company. With baseball rosters thinning because of the war, Bush staged an unlikely comeback at the age of 42. After working out with the Cubs, he signed a contract with the Chattanooga Lookouts of the Class A-1 Southern Association in July 1944. Bush’s 5-3 record and 3.13 ERA in ten games (nine starts), caught the attention of his former Braves manager and current Cincinnati Reds skipper Bill McKechnie, who invited him to spring training in 1945. Bush made four appearances in relief and, with players beginning to return from military service, was released in late May. Retiring for the second time, Bush finished his 17-year major-league career with a 176-136 record and a 3.86 ERA in 2,722 innings. A farmer and Southerner by heart, Bush spent a few years after his playing days in Chicago before retiring permanently to Shannon, Mississippi, near where he grew up. Raising vegetables and soybeans on his 50-acre farm, Bush never tired talking about baseball and moving from the small town to the big city to find fame on the mound. On July 2, 1985, he died of cardiac arrest at the age of 83. Funeral services were held at the First Baptist Church in Shannon and he was buried in the Shannon cemetery. 1 There is some debate about Bush’s birthdate. Throughout his playing career he listed it as 1903 or 1904 to appear younger. His Social Security Death Index says 1900; his gravestone says 1901, as do most of his obituaries. 2 Edward Burns, “Page Mr. Alger! Home Town Boy Makes in Good in Big City,” undated Chicago Daily Tribune article in Guy Bush player file, National Baseball Hall of Fame. 3 “Irelan’s Pupil,” Decatur (Illinois) Review, April 3, 1924, 14. 4 Edward Burns, “Page Mr. Alger,” Guy Bush player file, National Baseball Hall of Fame. 5 “Kelly Gets the Hammer, Giants Win,” Wisconsin State Journal, Madison, Wisconsin, September 18, 1923, 16. 6 Irving Vaughn, “Cubs Come Back With Twin Win in Coast Games,” Chicago Daily Tribune, March 17, 1924, 25. 7 For example, see Irving Vaughn, "Cubs Splash Whitewash on Giants," Chicago Daily Tribune, August 8, 1926, 23. 8 Irving Vaughn, “Tireless Energy and Desire to Learn Lift Bush to Top,” Chicago Daily Tribune, September 14, 1932, 19. 9 Irving Vaughn, “Guy Bush’s 20-Year-old Brother Signs With Cubs,” Chicago Daily Tribune, February 1, 1928, 29. 10 Irving Vaughn, “Guy Bush Picked to Face Athletics Today,” Chicago Daily Tribune, October 11, 1929, 23. 11 F.C. Lane, “The Only Winning Pitcher,” Baseball Magazine, November 1930, 555. 12 “The Series Cast in Person,” undated, unidentified publication in Guy Bush player file, National Baseball Hall of Fame. 16 Chicago Daily Tribune, July 9, 1930, 30. 20 Edward Burns, “Wilson Clouts 53d Homer; Cubs Win 6-3,” Chicago Daily Tribune, September 23, 1930, 17. 21 The Sporting News, August 13, 1931, 1. 22 The Sporting News, August 20, 1931, 4. 23 Paul Michelson, “Bud Tinning Is Cause of Cubs Winning Streak,” Associated Press article in Biloxi (Mississippi) Daily Herald, July 16, 1933, 3. 24 “Salads and Cigars,” Associated Press article. 1932, Guy Bush player file, National Baseball Hall of Fame. 25 The Sporting News, August 18, 1932, 1. 26 The Sporting News, October 13, 1932, 3. 27 Paul Michelson, “Guy Bush certain Cubs will retain loop championship,” Associated Press article in Biloxi (Mississippi) Daily Herald, April 11, 1933, 5. 29 “Bush, Dizzy Have Feud,” United Press article in Milwaukee Journal, April 25, 1934, 19. 30 The Sporting News, November 29, 1934, 2. 31 The Sporting News, July 25, 1935, 1. 32 Robert Shaw, “Babe’s 714th a monumental blast,” Associated Press article in Cleveland Plain Dealer, May 25, 1974, 6-C.
33 The Sporting News, July 23, 1906, 1.